I don't know a great deal about sewing machines, but I do know Brother is a respected brand, and this has free-motion embroidery and quilting features. So it would perhaps make a nice Christmas present for a crafting enthusiast - I would ask the recipient first if this was a suitable for their needs though. Next cheapest price I can find is £299. It’s usually on lightning deals for less. "Usually" - once two years ago? ‌ That deal is a bit dated. But in fact it was a Deal of the Day on Amazon a few days ago, but at this price I think. It's a good deal. 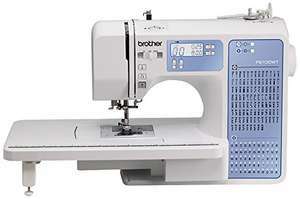 Been looking at this for my wife (she really wants a £1k+ Bernina (horror)) and it gets good reviews. Can anyone recommend a quality embroidery machine under £650? Thanks in advance for your time. bargainsmakemehappy im after a embroidery machine but its to expensive so i'm saving up yet. im looking at one for £900. Can anyone recommend a quality embroidery machine under £650? Thanks in …Can anyone recommend a quality embroidery machine under £650? Thanks in advance for your time. bargainsmakemehappy im after a embroidery machine but its to expensive so …bargainsmakemehappy im after a embroidery machine but its to expensive so i'm saving up yet. im looking at one for £900. I can highly recommend this brother embroidery machine and this company. Ask for Russell if you phone up, he’s the boss and incredibly helpful and knowledgable, and best of all he wants happy customers and won’t push the most expensive model on to you if you don’t need it. That one is a-grade but I’ve bought about 5 machines from them and never had a problem. Actually I did have a problem with one machine, which they collected the next day and it was fixed and back with me within a couple of days. Which reminds me - pro tip - if you buy a sewing machine online, always keep the box in case the machine needs to go back for any reason as then it stays safe in proper packaging. I can highly recommend this brother embroidery machine and this company. …I can highly recommend this brother embroidery machine and this company. Ask for Russell if you phone up, he’s the boss and incredibly helpful and knowledgable, and best of all he wants happy customers and won’t push the most expensive model on to you if you don’t need it. https://www.sewingmachines.co.uk/products/brother-innov-is-955-sewing-and-embroidery-machine/255Although I’d be tempted to spend that little bit extra and get this one with the bigger embroidery space https://www.sewingmachines.co.uk/products/brother-innov-is-1250-a-grade-sewing-embroidery-machine/193That one is a-grade but I’ve bought about 5 machines from them and never had a problem. Actually I did have a problem with one machine, which they collected the next day and it was fixed and back with me within a couple of days. Which reminds me - pro tip - if you buy a sewing machine online, always keep the box in case the machine needs to go back for any reason as then it stays safe in proper packaging. Thank you for your input, its much appreciated.